I'm back to buying water in bottles, as The Gambia doesn't have those bargain half-liter bags that were so common in Senegal and Mali, possibly because they are government subsidized. 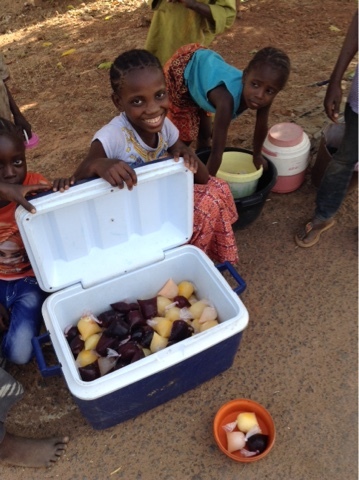 But The Gambia has something even better--home-made small bags of frozen juice. They are sold by women and young girls in villages sitting along the road with a small cooler packed with them. I can cut them into quarters with my knife, drop them into my thermos water bottle, add just enough water to begin the melting process and I am in instant heaven for the next half hour as the drink remains ice cold in my insulated water bottle. If it weren't for these fruity ice balls, I could go long spells without a cold drink, as few of the villages have electricity. I don't know how and where the bags come to be frozen, but whoever is responsible has earned my great gratitude. In one village where no one was selling the ice balls I asked if there was a place to buy cold warer. I was directed to a guy who had a refrigerator powered by solar panels. Cold drinks were just a minor part of his business. Mostly it was charging phones and other devices. His fee was ten cents. He had a couple dozen phones laying on his floor. I won't be in any hurry to leave The Gambia, not only thanks to the frozen juice balls, but also because of the great cordiality of its people, not to mention English being its official language. I was given an instant warm welcome at the border with the customs officials going out of their way to oblige me. I arrived at five, fearful it might be closing. I knew I was cutting it close, but I had been delayed on the Senegal side by an excessively friendly soldier who kept me in conversation longer than I wished. He assured me though that The Gambia border was open until six. No traffic had passed me from either direction for over half an hour at this quiet crossing point, so I was concerned, but it was still in operation when I arrived at the offices a mile past the Senegal offices. It was eight miles in both directions to a town, so there was no confusion guessing which building to go to as there were no others. I was a little nervous about not having a visa, hoping Lonely Planet was still correct that one would be let into the country and then have three days to acquire a visa at the capital. They weren't fully correct about that, as one could now get a visa right at the border. Unfortunately for me, the person who issued visas was off duty at four. If they had wished to be stubborn and make life difficult for me, they could have told me to come back the next day, but with so few people crossing at this border they called the guy who issues visas and he was happy to come back in and do it. I was told the fee for a visa was 3,000 dalasis, which I was told was about $80. I hadn't converted any money and there was no way to do it at the border, so happily they would accept dollars. The latest exchange rate was 47 dalasis to the dollar, which would be $63. Not too long ago it was 30 dalasis to the dollar. If I had acquired the visa from The Gambia embassy in the US it would have been $100. This visa official could easily demand $100, but he was not an extortionist, and agreed upon $65. 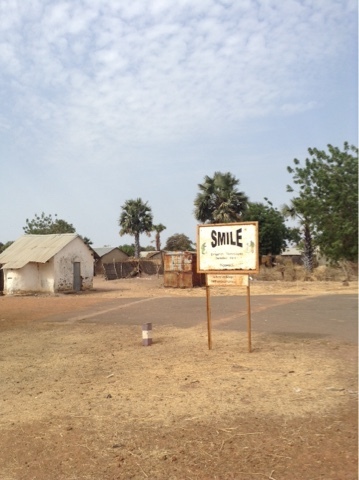 He was so friendly and obliging, he even offered to drive me the eight miles into Basse to a guest house. I still had an hour of light, so there was no need for that, plus I would camp if I could, and so I did, capping a wonderful entry into Africa's smallest country. 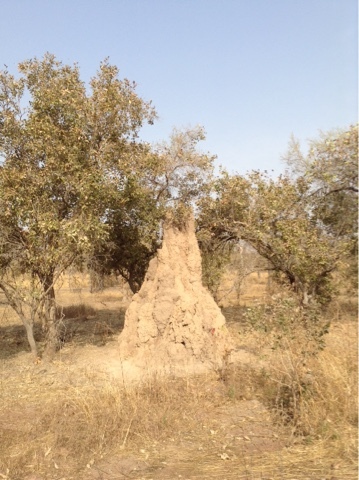 It is just 200 miles long and not much wider than 25 miles as it follows The Gambia River. It is surrounded by Senegal other than its Atlantic coast line. 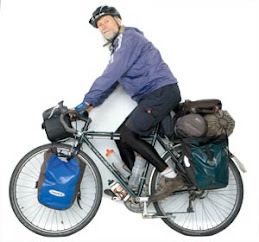 I had entered at its eastern end, so would have the pleasure of bicycling from one end of the country to the other. Changing money in Basse was as pleasant as gaining entry into the country. Though my debit card was rejected by an ATM, a nearby exchange bureau gave me 47.5 dalasis for a dollar and without any commission. The young man who handled the transaction was delighted to learn my nationality. "I have great respect for the United States," he said. Then he asked if I was in the Peace Corps, as the only Americans he had ever met were in the Peace Corps. I was happy he gave me a thick wad of 48 notes for my $100, all hundreds and one fifty, so I had no worries about trying to break larger bills, as the ATMs of Senegal and Mali had dispensed and were just about impossible to pass. My first expenditures was a bowl of gruel for twenty cents and then a bottle of vanilla milk and the first pack of ramen I had seen in these travels. I had brought two as emergency rations and had only needed to use one so far, so it was good to restock. It has been a genuine pleasure to be able to speak English, and have road signs in English, though many people only speak their indigenous language. Another of the early delights of The Gambia is discovering packets of mango powder with vitamin C to flavor my water--a ten-cent pack is good for two liters. I will stock up on those to last the rest of this trip and others to come. They will greatly enhance my fluid intake. The first woman I bought a frozen juice from pulled a bill from her pocket to show me how much it cost, not even knowing numbers in English. The preferred term for dalasi is dollar, as people most frequently give a price of such and such in dollars rather than dalasi--ten dollars for a hard boiled egg, twenty cents, or five dollars for an ice ball, ten cents. 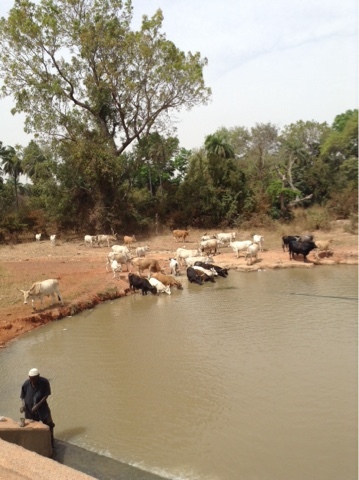 I haven't seen the river that runs through The Gambia yet, but I came upon the first swimming hole of these travels--an event to celebrate. I didn't take a swim, but I did give myself and my shirt and neckerchief a wash at the mini-dam where the water flowing over it looked fairly clear. A guy was fishing with a stick as a pole. Bicycles are much more evident here than in Senegal and Mali. Basse, the only significant city in the eastern half of the country, had at least two good-sized bike shops with a couple dozen bikes out front of each. The bikes aren't particularly well-maintained. Two cyclists I've talked to had detached, non-functioning brakes. The highway is in fine shape with a nice shoulder that I have no need of as there is so little traffic. The road that runs through the country is not a trucker's route, nor even much of a bus route other than small local vans. Despite the river the land is not much suitable for agriculture, just minimal grazing as in Senegal and Mali, so there is no significant traffic related to commerce. The prime entry to the country is at its western end near the capital and all the resorts. It is very pleasurable cycling, other than the 90 degree temperatures. And though this was an English colony, driving is on the right. One of the more evident English influences is school children wearing uniforms, unlike Senegal and Mali--boys blue shorts and a white shirt, and girls a green dress. Another leftover of the British presence is occssionally being addressed as "sir," such as "Good morning, sir." Not the children though. They ask for money, some even saying, "Give me buck." 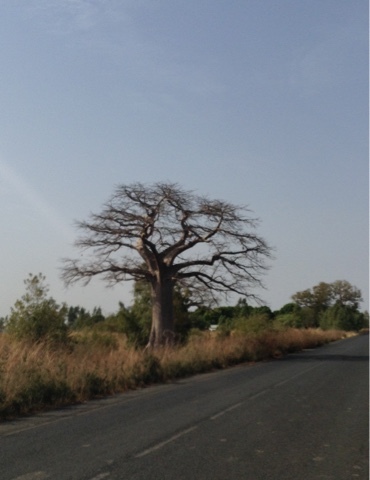 It was fifty miles before I came upon a baobab, as regal as ever, and with a green background here. When I reach the Atlantic where all the resorts are, many catering to packaged tours from Europe, I will be looking for an outdoor store with tents. The zipper on my tent is kaput. I initially tried using paper lips to hold the flap together, but not very effectively. If the mosquitoes become an issue, I could use duct tape or semi-smother myself by letting the rainfly hug the opening. In the meantime I have temporarily hung a colorful exotically-patterned wrap-around skirt I found along the road over the entry to my tent. When I saw it I thought it was a fabric that would please Janina. Later I realized it might have been a guardian angel coming to my rescue to aid my tent crisis. It pretty much keeps the flying insects out, but not the ants. My tent isn't my only casualty. The washer on one of my pumps ruptured, rendering it useless. I have long traveled with a spare. I also lost two buttons on my shirt. I could at least repair it with my needle and thread and buttons off the pockets of the shirt. My generator seems to be okay. It was the batteries that were resisting being charged, so now I directly charge my iPad. It's not as fast, but it is a relief as The Gambia uses the English three-pronged electrical outlets which I didn't bring an adaptor for. So many "first world problems" George! Thanks for sharing your journey. The Gambia sounds wonderful. Gambia sounds great. I want to go. Go George! Go. Glad things are rolling along for you. 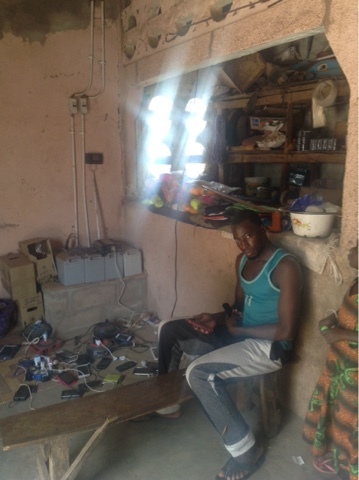 I have a good friend from California who just returned to the Gambia. Blessings and safe travels. Kafoune, Bruce and Mali.